On Friday, September 28, the SDMFC monthly convening covered the topic of New Parent Support. Numerous military providers, agencies, and individuals gathered to learn valuable information on the various resources available to military families and new parents. Our guest panelists represented Rady Children’s Hospital San Diego, SAY San Diego, Navy New Parent Support, and the NAS North Island Navy & Marine Corps Relief Society Budget for Baby. Thank you to our panelists for sharing their knowledge and expertise! 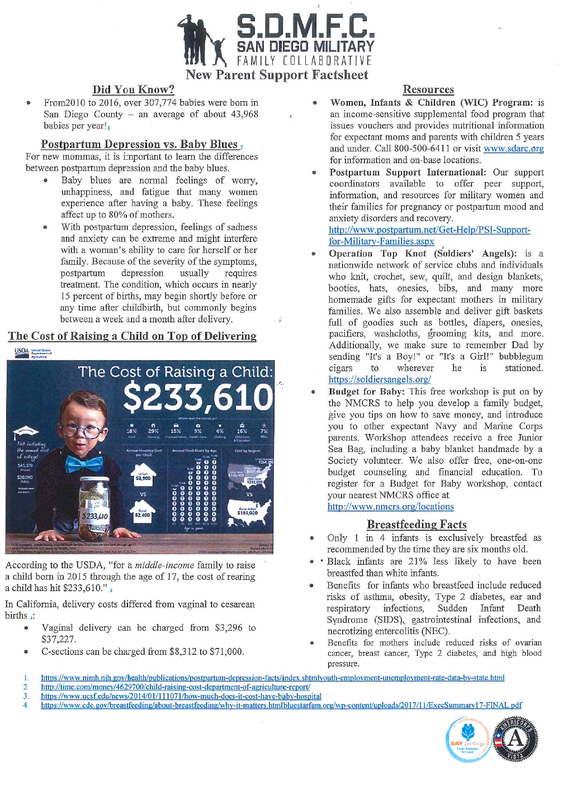 SDMFC also provided an informative factsheet, which included up-to-date statistical information regarding the San Diego birthrate, how to handle postpartum depression, the costs of raising a child, a brief list of very helpful resource websites, and breastfeeding facts, among other things. Check out the factsheet below, or DOWNLOAD IT HERE! Click here to watch the panel on New Parent Support! ***Be sure to join us Friday, October 26, at Bankers Hill Club for SDMFC’s 9th Annual Conference, themed “Six Degrees of Collaboration” – RSVP here!